Same as gift wrapping, I don’t enjoy baking much. And same as with gift wrapping, I found a way to make it more fun for me. For years now, I team up with my childhood friend, Bernadette for our annually Christmas cookie bakeathon. Really, Bernadette and her brother Tobias are more than friends, they are family! The three of us spent most of our childhood together. Want a little laugh? Come, see us three in the wild 80s? Tobias recently moved houses and I made him a little something. 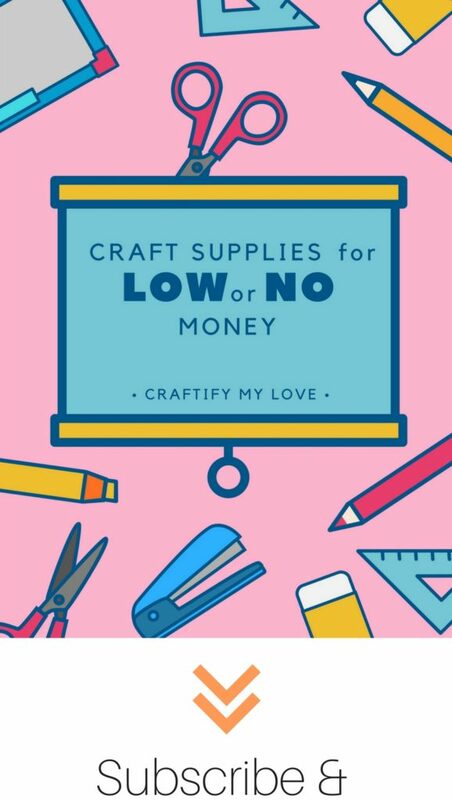 This could also be a great DIY gift idea for Christmas, just in case you are looking for some inspiration. Back on track! Bernadette doesn’t like the assembly, decorating and storage part of the Christmas bakery. I don’t enjoy the dough making, rolling & cookie cutting process. So basically, we are the perfect team. 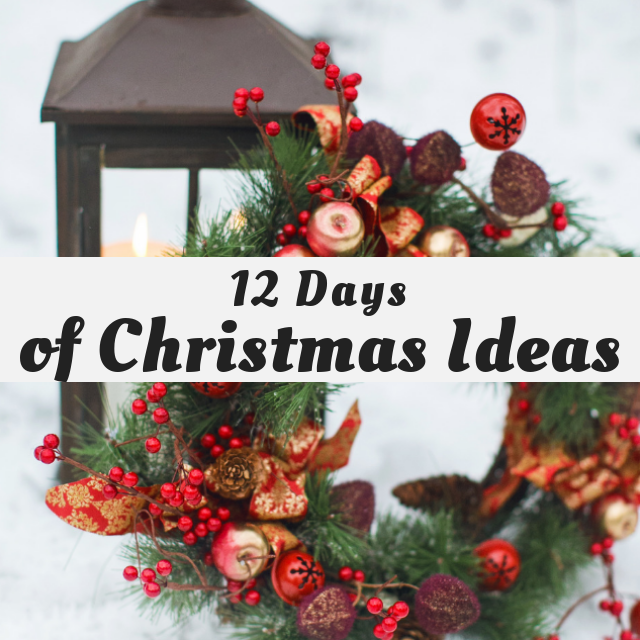 I have teamed up with 50 plus bloggers to bring you a ton of DIY Ideas and Recipes to make your holiday season merrier. 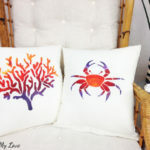 There are 12 different posts in the series (but I only do 5 and today is my last one) and we have spread them out over a four-week period with three posts per week. Now is the time to subscribe! Today is Day 11 and thus I spent last Saturday in the kitchen with Bernadette, making something sweet to share! You’ll sieve the flour through the strainer into your kitchen machine. My friend has a Thermomix (I’m not sure if this brand is known outside of Germany as well) and graciously prepares all the dough we need for our annual baking day in advance. This way we can work more productively that day. Add the butter. We recommend you cut the butter in small pieces. Add the egg yolks, sugar, vanilla sugar, lemon zest, and ground hazelnuts and (let the machine) work everything into a short crust. Place your cookie dough into a food storage container (not a green alternative, but also possible: tin foil or cling film) and let it cool down in the fridge for 2 hours. 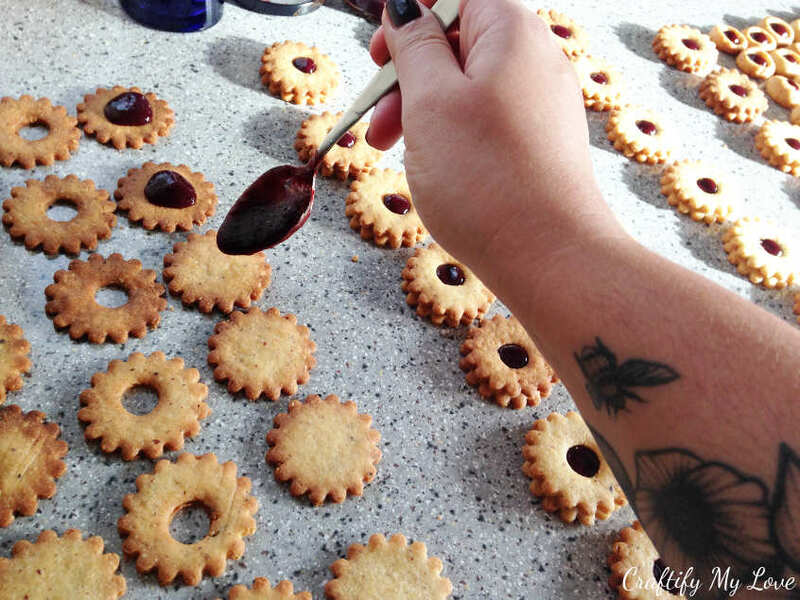 How to Make Spitzbuben – My Favourite Christmas Cookies, Ever! Pre-heat the oven to 392 degrees Fahrenheit / 200 degrees Celsius. 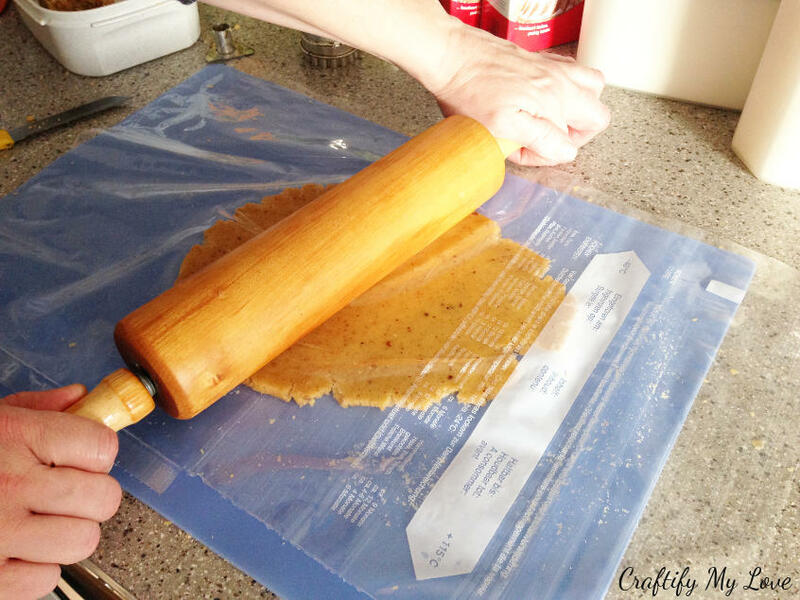 Using a baking mat, a cut-open freezer bag, and a rolling-pin flatten a portion of your dough. The thinner the more delicate (and more delicious?) the Spitzbuben. 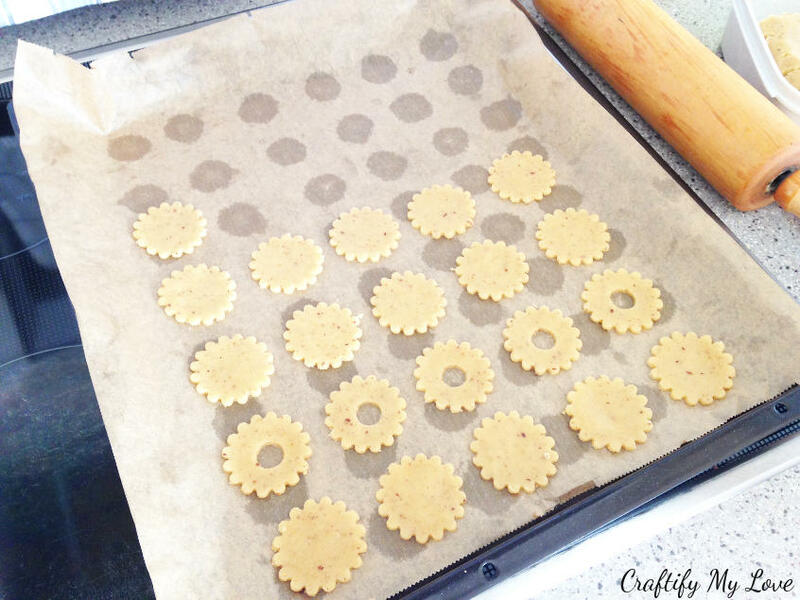 Grab your cookie cutter and cut out as many cookies as you can. 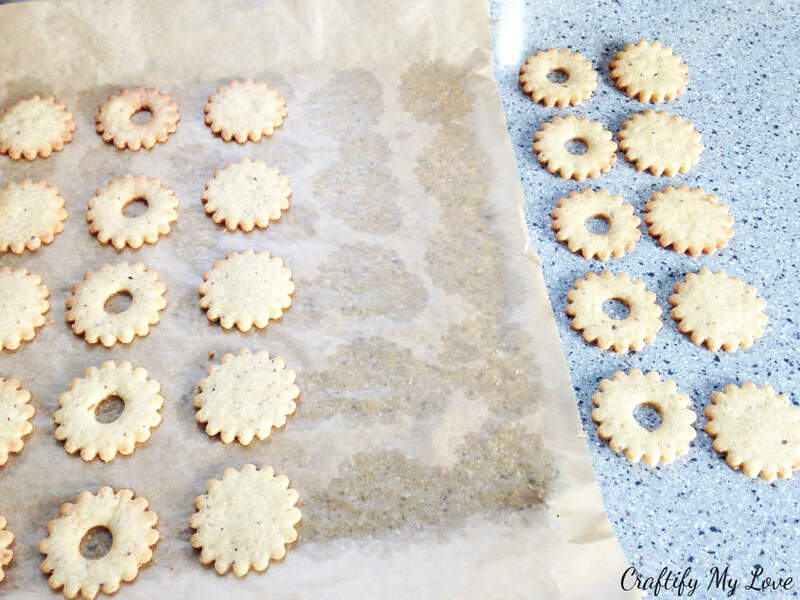 Using a little knife, lift the individual cookies from your baking mat and place them on your baking tray (either non-stick or covered in baking paper). 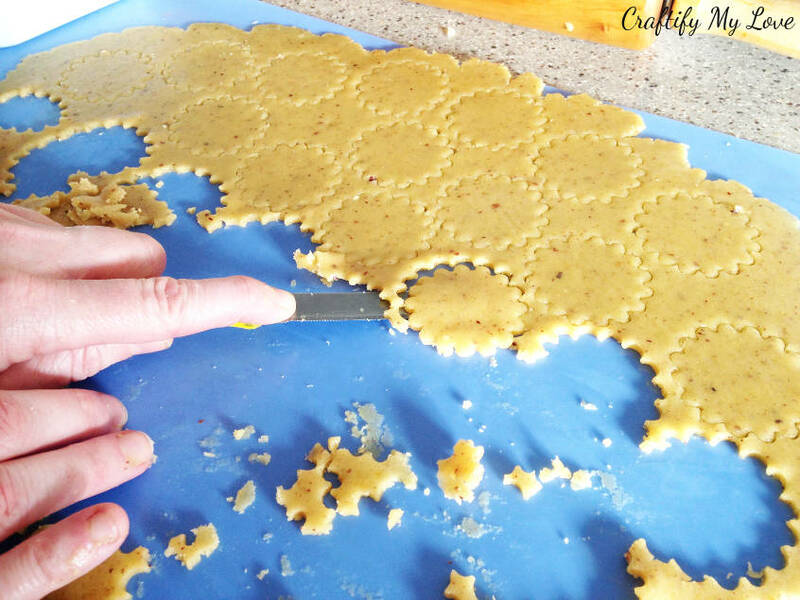 Tip: Cut out the center hole in all the cookies of every other row. This way you’ll end up with the right number of cookie bottoms and lids. Bake your cookies for 10 minutes in the middle rack (is that even the right word?) of your oven, or until they are golden. 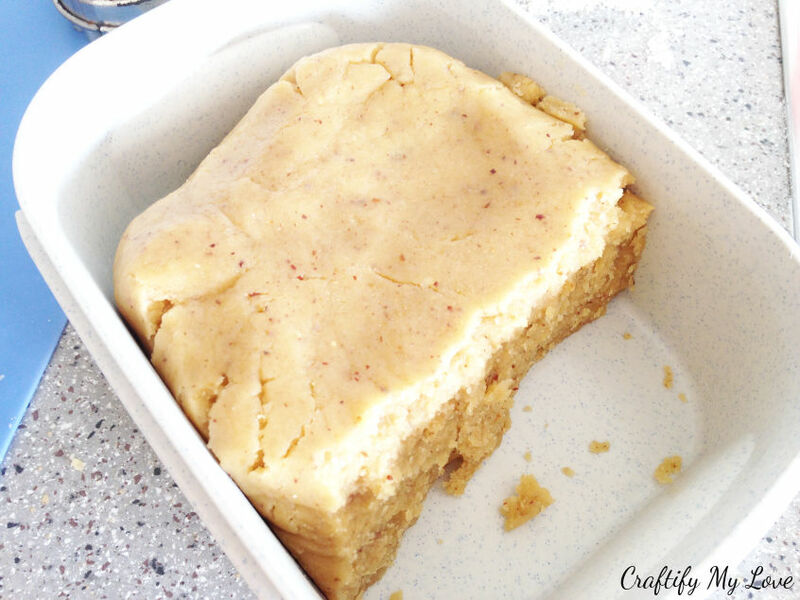 You can prepare the cookie dough in advance and store it in a Tupperware container in your fridge. It will be ok for a couple of days at least. If a batch of your cookies gets accidentally too dark (because you chatted away and away and away…and all but forgot the time), simply pair a dark and a light one during the assembly. This way the Spitzbuben will still taste delicious and not too crunchy. And you won’t have to waste precious cookies. 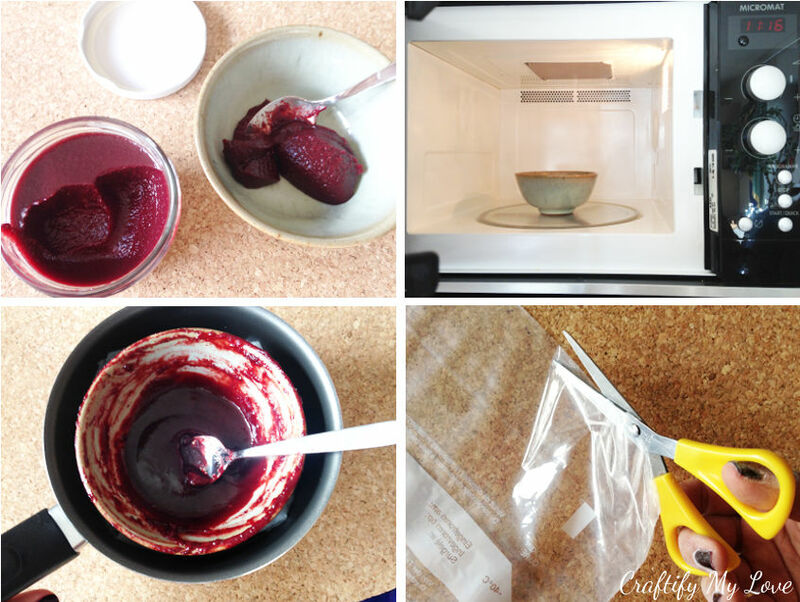 For an easier and prettier assembly: Place some jam in a microwave-safe dish and microwave it for 30 seconds. This way the jam will get very creamy (almost liquid but not quite) and you’ll be able to apply it better. When the jam sets, the part peaking through the hole will look very smooth. When you have a very stubborn jam (like I had this year – it was a homemade, super delicious but annoying 😉 one by Bernadette) and it will thicken only a few seconds after it left the microwave, you can help slow down that process by placing it into a bowl with very hot water. But be very careful when handling it! If you want to prevent the cookie dough from sticking to your rolling-pin, cut open a freezer bag (two, if you don’t own a baking mat. 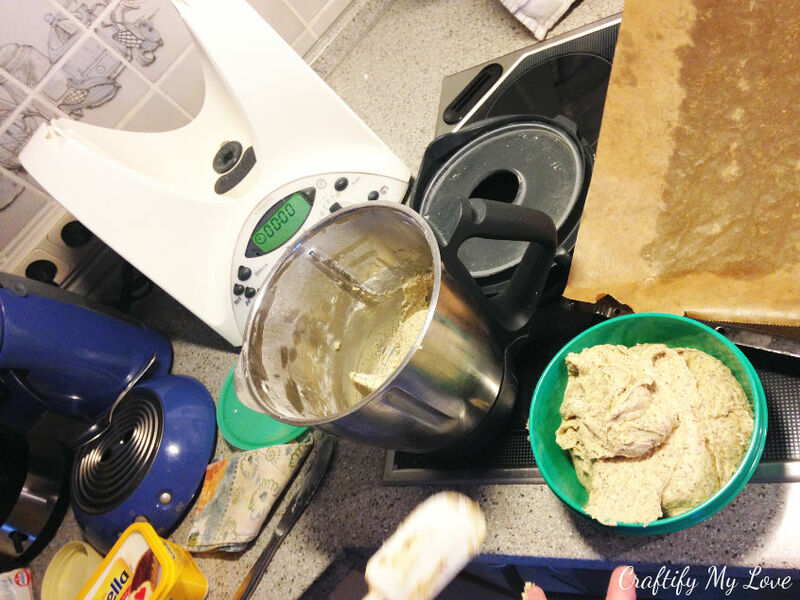 Use the second one as your work surface) and use it as a separation between the dough and the rolling-pin. You’ll find even more tips throughout this post. Using a tea-spoon you’ll now want to add a blob of your strawberry jam (or any other kind of jam you prefer) to the middle of your cookie base. Tip: You’ll learn quickly how much to use. 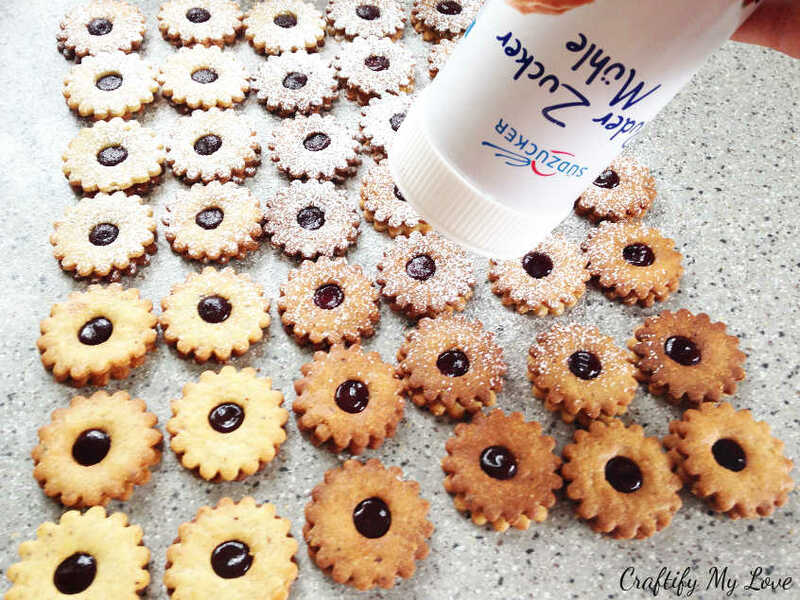 Too much, and the jam will squeeze out of the cookie, too little and your Spitzbuben will taste dull. I encourage you to taste one to make sure you get it absolutely right, lol. Entry, icing sugar. This is a dead sure sign that you’re almost done. Hooray! I found this efficient container that already has a built-in colander. Apply a good amount of your icing sugar on your cookies. You’ll notice that the jam will absorb the sugar, that’s ok. You’ll want the red dot to be visible. Tip: If some of your cookies are a little too tan, simply apply more sugar. 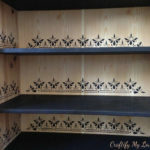 How to Store your Christmas Cookies for Best Results? In Bernadette’s home, tradition asks to save all the Christmas cookies for Christmas evening and the time that follows. There is not one cookie to be eaten before that date. The cookies are best stored in metal cookie tins. 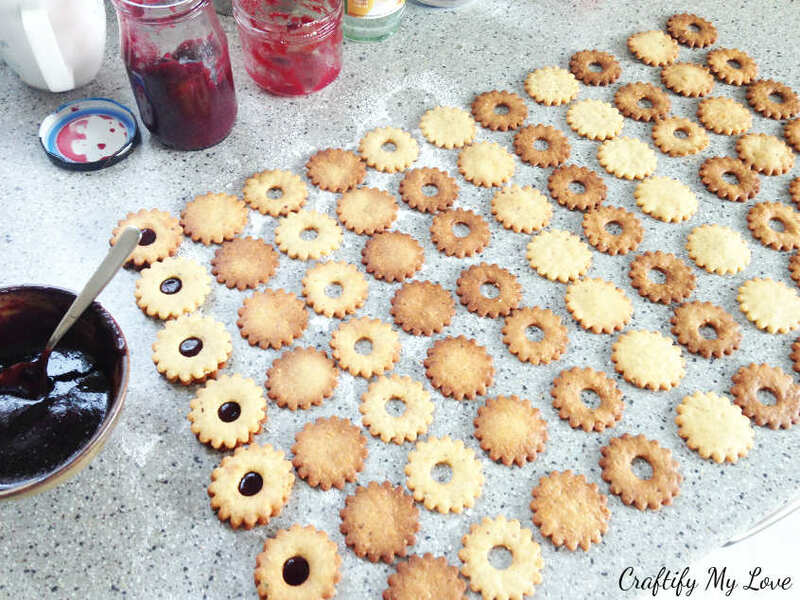 If your cookies are made with jam you’ll want to add a sheet of freezer paper or baking paper (whatever you have at hand) in between layers. Tip: If you have a type of cookie that needs to soften a bit (see the Lebkuchen type ones – brown circles with a white almond in the middle), we simply add a slice of apple to the box. 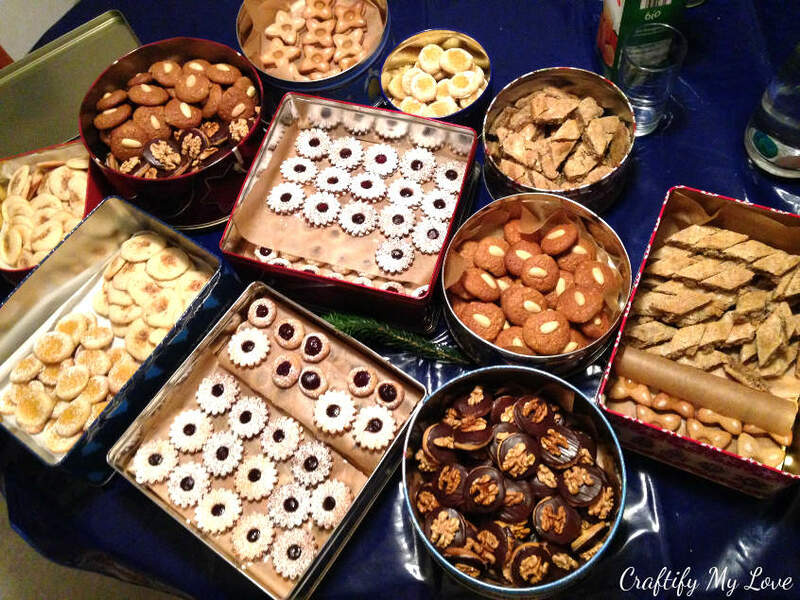 These 11 cookie tins hold 8 different types of Plätzchen (that is how we call our Christmas cookies in Germany). Bernadette and I accomplished quite a bit this year on our annual Christmas cookie baking marathon, don’t you think? What is your favorite type of sweet treat for Christmas? 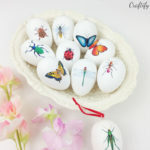 Are you like me and favor the jam or jelly ones? Oh, I almost forgot. 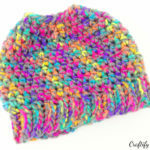 I have an early Christmas present for you! 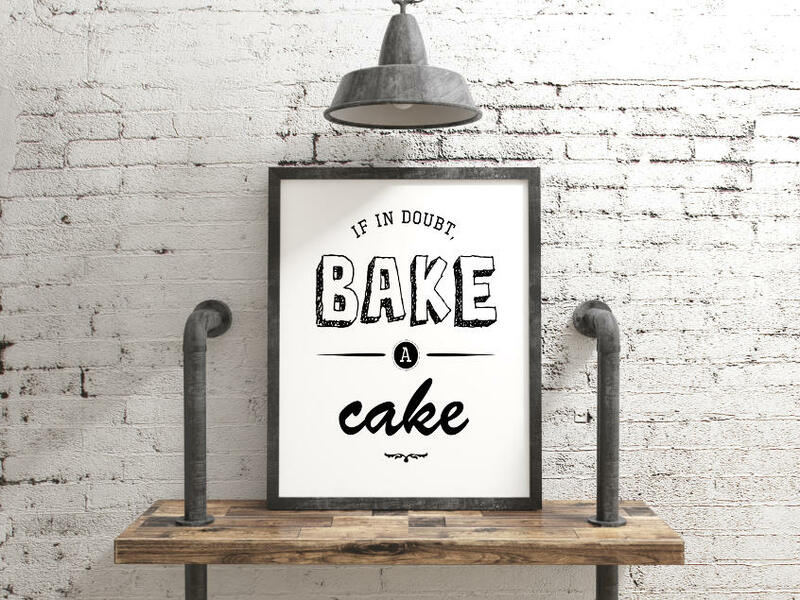 Grab this Baking Themed Wall Art for FREE Today HERE as a thank you for being my friend, subscribing to my newsletter, and sticking around. I made this several years back, framed it, and gave it to my cake-baking-goddess of a sister, Miriam. It’s in her kitchen and – if you want – it can be in yours now, too. With this post, I’ll leave you to it this year. 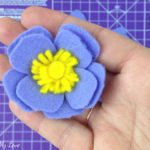 I had a few more tutorials planned (and even made). But if I am quite honest, I need a break. Simple as that. With that being said, I wish you and your family a wonderful Holiday season. 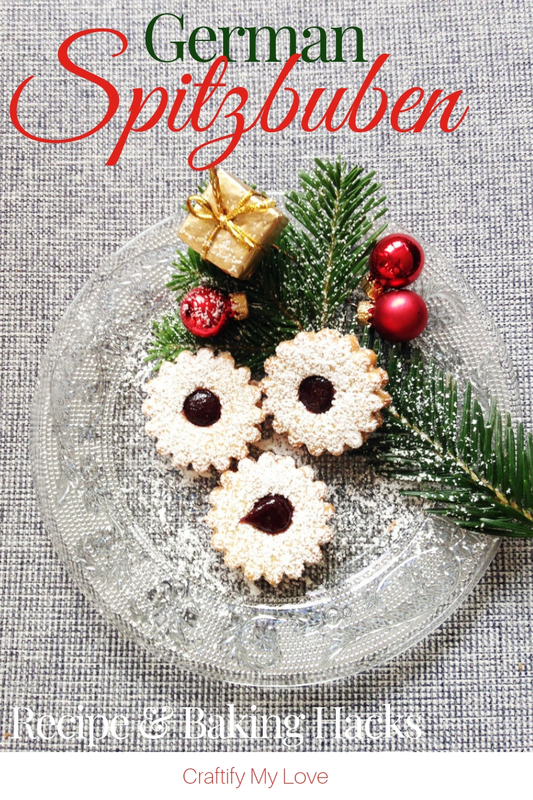 Happy crafting, munching on cookies, unwrapping those wonderful DIY Christmas gifts, & see you next year. These look amazing! 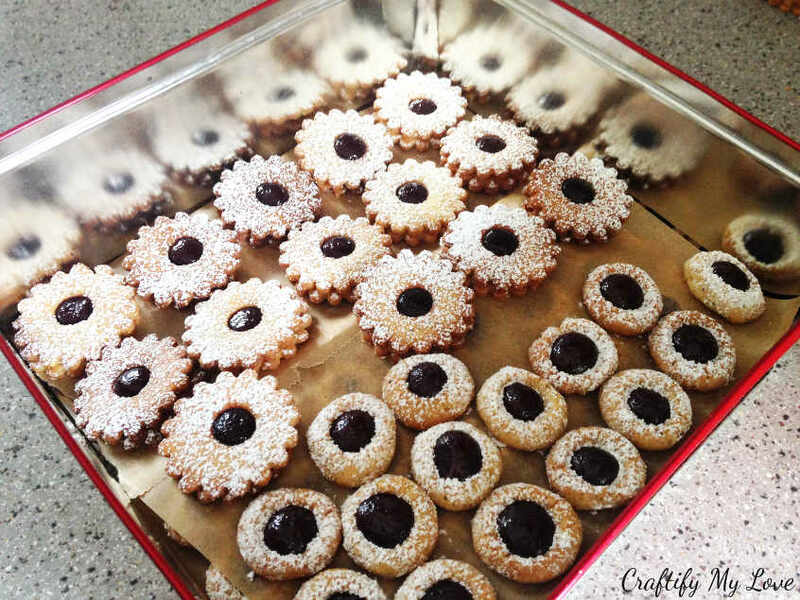 I love cookies with jam inside and powdered sugar on top. I can’t wait to try the recipe. Thank you, Jenny. I’m about to go into the kitchen to get a little plate to snack on my couch tonight. Yum. These cookies are calling to me…must be my German ancestry! It looks like a bit of work, but absolutely worth it! I hear you about needing a break, I’m right there with you. Merry Christmas! I look forward to your posts in 2019! I love jam filled cookies! Especially with fabulous, homemade jam! And after making these cookies, you could whip up some meringues with the leftover egg whites. Perfect synergy. That is a good idea. Usually we do just that. We have a delicious recipe using dates and almonds. Yum. I love making these cookies during the holidays because they look so pretty and festive on a cookie tray. I’ve never made them with homemade jam though so I’m pinning your recipe to refer back to when I make them next week. 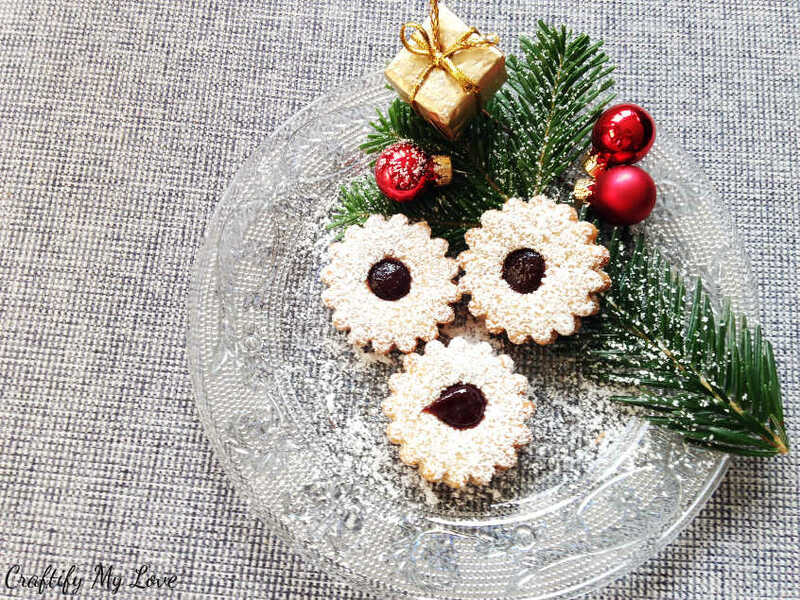 Cookies with jam are delicious! I have been wanting to make more German food as I have a lot of German heritage, these would be a fun place to start! Carlee, that is great. If you ever need me to translate something for you, or need a German insight, let me know. They look delicious! Thank you for sharing the recipe and the instructions at The Really Crafty Link Party. Pinned! Teresa, I’m glad you like them. Thank you for the possibility to share at your party. I would have tasted a ton and often by Christmas Eve, the cookies are mostly gone in our house!!!!! Same here, Markus found his taste for a new type we made. They are almost gone, lol. Those sound delicious and they look sooo pretty too! Those look delicious! Now I kind of wish we had saved some strawberry jam from the batch we made this summer. 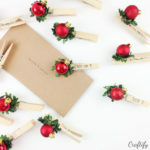 Thanks so much for sharing with us at the Happy Holidays Link party. Pinned. Thank you for pinning and leaving me this note. You could make a mental note for next summer to put some homemade jam on the side. Thanks for sharing your recipe here! My husband has been planning to make a jam cookie for some time and I will share this with him. Happy Holidays from L.A.